I agree that my personal data will be processed by the Centre d'Infertilitat i Reproducció Humana de Lleida S.L. (FIV-Lleida) for the request for information request according to its Data Protection Policy. 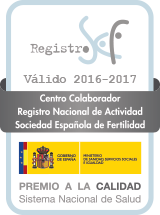 On FIV Lleida Infertility Center treat infertility from a multidisciplinary perspective that allows us to identify the nature of your problem and determine the best treatment for each case.